Let’s All Speculate Wildly About Sleepy Hollow! As many of you may know, there have been some serious developments in both shows. 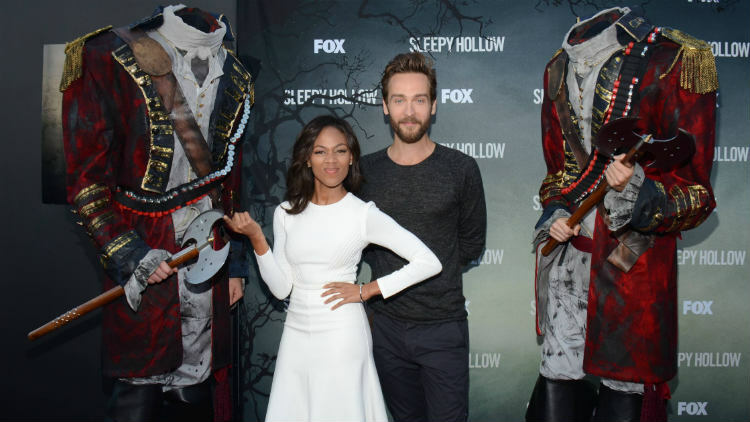 Let’s talk about Sleepy Hollow first. In what I found to be a shocking turn of events, my favorite character on the show has was killed. He was the most promising character on the show, something of a dark horse who had just begun to fulfill his potential. What do we make of this sudden death? Given the show’s track record I have no doubt he’ll come back as some kind of ghost. Or he’ll be revived with a spell. Or rescued from Hell via a mystical ladder hidden by George Washington underneath the Liberty Bell (an actual possibility asWashington is slated to appear on the show). I’m not worried that we have lost this character forever – I’m sure the writers have some spectacularly melodramatic plan for his resurrection in the works already. Any one have any theories as to how he might come back? More intriguing to me is the love triangles that are forming among the primary characters. First we’ve got Ichabod, Abby, and Katrina – the original. Katrina and Ichabod are on a break – yikes – so now there’s a chance fan fiction might become reality. Here’s hoping! An added complication, however, is the introduction of the dreamy Nick Hawley, who harbors a bit a crush on Abbie but appears to have previously been involved with her sister Jenny – a bit incestuous don’t you think? And will most certainly result in another feud between the sisters if Hawley continues to pursue Abbie. And how can we forget Katrina, Van Brunt (the Headless Horseman), and Ichabod. I think Katrina may have caught feelings for her captor, who it’s clear cares deeply, and genuinely, for our resident witch. Once the confirmed villain of the show, I’m hoping for a conversion to the side of good as he attempts to win his former fiancé back. Less likely, but more fun by all accounts, is the possibility that Katrina – champion of her (mostly) evil son – gives in to evil, and lends her powers to the dark side. What a juicy betrayal her switching sides would make! Speaking of both betrayal and sons, what exactly is to become of Henry Parrish? Sure, he averted the apocalypse for the side of good when he stabbed his demonic dad but will he take up the mantle of darkness and try to bring about the end times on his own? Or will be change his ways after all, making way for a new villain to take Moloch’s place? The latter I hope, if only that it would breathe new life into an exhausted plot line. Perhaps Henry could work as mole for Team Witness, playing pretend evil as the demons re-gather their forces. What do you guys think is going to happen? Let me know in the comments. ← Action and adventure in SPARK RISING! Man, it doesn’t even occur to me to follow the story–it is SO convoluted and er, flexible. LOL I just watch it for the perty peeps and their ensuing sparks 🙂 But thanks for making some sense of it all!